The Executive House is the low-slung “Prairie Style” home, as described by author Ruth Quinn in her book on architect Robert Reamer, Weaver of Dreams. It sits across the road at Mammoth from the terraces and Liberty Cap. It was built in 1908, just a few years after Reamer’s most famous creation, the Old Faithful Inn, which opened in the summer of 1904. 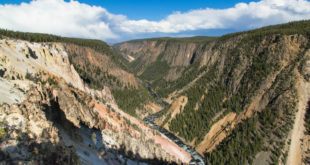 According to Quinn, Harry Child, the owner of the Yellowstone Park Company, a former longtime concession operation within Yellowstone, commissioned the house. The home today still houses a concession company general manager, Xanterra Parks and Resorts’ Mike Keller. Keller replaces former GM Jim McCaleb, who retired earlier this year. Keller and his family—wife Cynthia and two daughters, 12 and 10—moved into the house in late July. 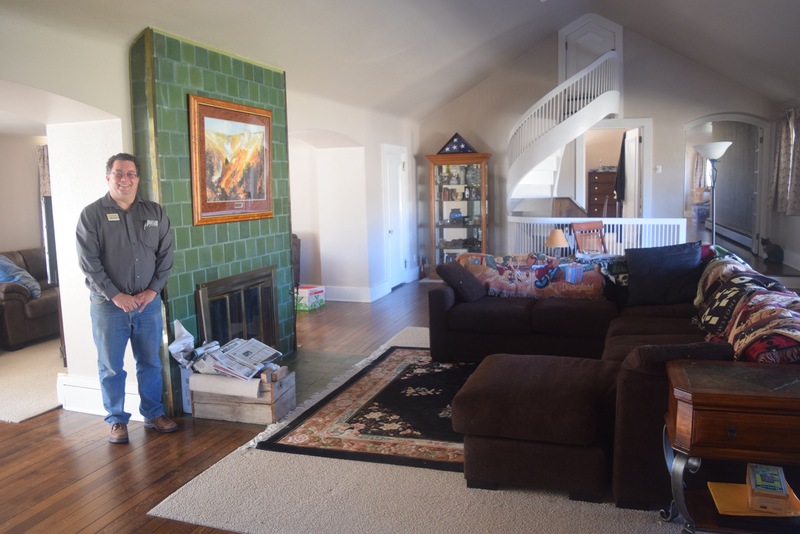 Living in the house is something of a lifelong dream for Keller, who caught the Yellowstone bug as a child when his family visited the park throughout his childhood. “This position doesn’t turn over very often,” Keller said, feeling privileged to have been chosen for it. Living in the historic 3,300 square foot home, with a swooping driveway and large picture windows, has some fishbowl-like qualities, he said. When the elk gather in his front yard, they attract tourists. There are smaller houses down the road, and when Keller lived in one of them, he would sometimes come home to find visitors letting their kids play on his kids’ playground equipment or barbecuing on his grill and eating at his picnic table. Do they ever offer a hamburger at least? “No, but Cynthia’s had hot dogs,” Keller laughed. He’s seen tourists get way too close to the elk, which, despite their habit of hanging around people all year, are still wild animals. The bulls charge people sometimes, he said. In the winter, it’s pretty mellow. It the fall, during the elk rut, the males get aggressive with each other in their competition for females. “We call it elk prom,” he joked. In the early summer, there are elk calves all around. Keller theorizes the female elk hang around the developed area with their young ones because they’ve figured out wolves—who love elk calves—won’t come so close to people. Keller said sometimes he can’t get to his car parked out back because of the all the elk. He can work remotely from home until they move, he said. And he is the boss, after all. The Keller have three cats, and when they all first moved in, the cats and the elk would sometimes be nose-to-nose through the glass of the front windows. The cats have gotten used to the elk so it’s less of a thing now, but elk nose prints on the exterior of the windows were visible from inside. The cats are allowed outside in the enclosed backyard, but are always accompanied due to the threat of hawk predation. The children go to school in Gardiner, five miles down the hill from Mammoth. There’s a school bus that picks up the girls at the end of their residential road. Cynthia usually drives them to meet the bus rather than risk letting them walk the elk gauntlet. Mike and Cynthia met in Yellowstone. Mike has worked for Xanterra—minus one year at the Grand Canyon with another concessioner—since the winter of 1987-88, when he was 18 and old enough to occupy employee housing. His first job was cleaning rooms at the former Old Faithful Snow Lodge that winter. His love for Yellowstone began when he was just a kid, when his family would vacation in the park. His father took a golden parachute from a corporate job and moved the family to Livingston, Montana, 50 miles from the North Entrance, in 1985. Keller graduated from Livingston’s Park High School in 1987. Keller remains an avid Yellowstone history fan and geyser gazer. And he loves to show the house. President Franklin Roosevelt once stayed in the home, Keller says enthusiastically, most likely in the master bedroom. According to the National Park Service, FDR visited the park in 1937. There’s a bedroom and bath off the kitchen—former maid quarters. These days, it’s a guest room. The kitchen is galley-like with a small dining area that was once the butler’s pantry, Keller said. The formal dining room contains one of the few sets of furniture that come with the house — a large dining room table and chairs. Keller said legend has it there used to be a buzzer under the table that Mrs. Child could push with her foot to summon staff from the kitchen. There’s also the great room, with large windows that front the house. Then it’s a short step up—echoing the terraces outside—to the more private end of the house. Upstairs, there’s a master bedroom and bath, a middle room evolving into a study, then the girls’ rooms and a separate bath. 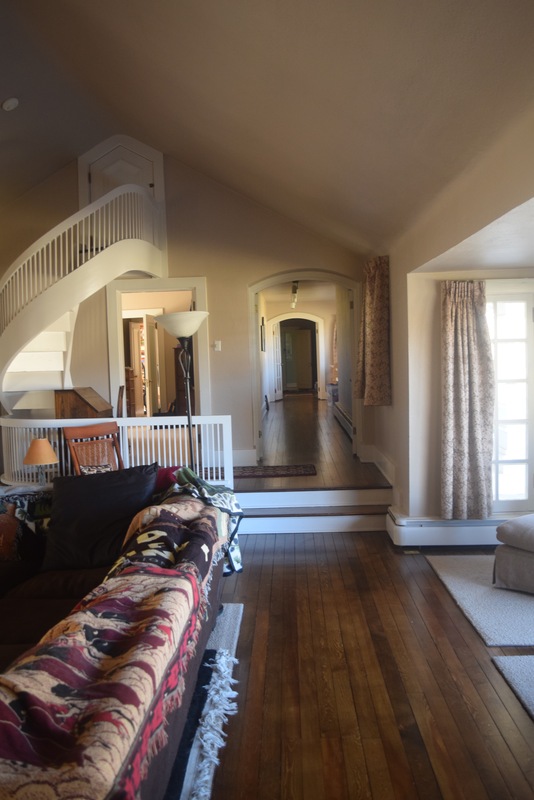 A short, steep staircase leads to a small, low-ceilinged room that will be Cynthia’s craft room. The bedrooms all face the back of the house for privacy. Keller explained that the road that goes past the house—these days a service road labeled off-limits to the general public—used to be the main road, so that’s why Reamer put the bedrooms on the back side of the house. There are rumors that the nearby Terrace Spring, during an active phase back in the 1980s, threatened to overtake the house. Not quite true, Keller said. It did take out a tennis court, though. If the hot spring did become active and threaten the house, the general policy is to let hot springs do their thing, even if a few sandbags are deemed necessary… on the other hand, the house is historic, designed by Reamer, so worth preserving. Keller said he’s been told the house could be moved. According to Keller, there is not a hot spring in the basement, and he is not aware of any ghost stories attached to the house. The company’s historic preservation crew keeps an eye on the house, but otherwise, there’s no housekeeping staff—the Kellers keep it up themselves. The kids have chores like in any other home; one of their jobs is sweeping elk droppings off the sidewalk and onto the grass. Even though they moved in back in July, the Kellers are still unpacking mementos and hanging photos on the long hallway between the living room and the bedrooms. Summer in Yellowstone is not the time to spend days off indoors, and the family enjoys getting out on their days off. Winter days when it’s 20 degrees below zero? That’s the time to unpack, Keller said. I asked what was the coolest thing about living in the Executive House. Keller doesn’t take more than a second to reply.